Modern networks are increasingly comprised of mixed physical, virtual, and cloud components distributed across geographies. As your network grows more diverse, it can become extremely difficult to confirm the security of all assets. For example, you may not even know when new devices or virtual machines join the network, much less whether they are non-compliant or contain vulnerabilities. That lack of visibility greatly increases your risks. DNS is fundamental to network, application, and service availability. The protocol is also the option of choice for DNS-based external and internal attacks. Ever-evolving DNS-based threats can disrupt your operations and inflict significant financial damage and negatively impact your reputation with customers. To secure diverse network infrastructure, you need enhanced visibility and specialized DNS protection that fills the gaps conventional network security measures leave unguarded. 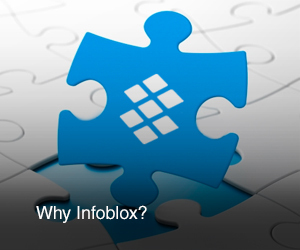 You get all of that and more with Infoblox. With Infoblox, you take security to the next level by maintaining application and service availability even under sophisticated DNS-based attack. You can only protect an infrastructure that you can see. With Infoblox, you can see everything: every network asset, virtual machine (VM), IP address, switch port, VLAN, username, and topology—and across all physical, virtual, and hybrid cloud infrastructure. Detailed, centralized reporting enables you to extract actionable insights from network data. The solution also continuously monitors and analyzes your network devices and applications, providing details on attacks by severity, category, targeted devices, and timeframes. Non-compliant and rogue devices on your network are potential open doors to attacks that can spread laterally inside your network—and with alarming speed. With Infoblox, you can slam those doors shut. Our Infrastructure Protection solution automates discovery of non-compliant devices as well as new devices and VMs that may contain vulnerabilities. The solution automatically initiates remediation measures, enabling you to quickly and easily fix configuration issues and enforce compliance mandates and security policies. With Infoblox Infrastructure Protection, you can comprehensively defend your DNS infrastructure from the widest range of DNS-based attacks, while maintaining application and service availability. It protects you against internal and external threats, including volumetric and exploit-based attacks such as DNS amplification and reflection, DDoS, NXDomain, TCP/UDP/ICMP floods, reconnaissance, cache poisoning, hijacking, and protocol anomalies. It takes contextual insight to stay ahead of today’s threats. Infoblox delivers. Our solution enriches your security infrastructure with consolidated, curated, and updated threat intelligence. It then shares that information automatically with security information and event management (SIEM) and Network Access Control (NAC) vendors via easy-to-consume APIs, syslog, and simple network management protocol (SNMP). The solution enables you to elevate your security posture by closing the loop between networking and security operations. For example, it can automatically detect the presences of new virtual machines (VMs) or devices and automatically trigger vulnerability scans before assets are allowed to join the network. Case Studies: Everi Holdings, Inc.